KAABOO Del Mar. Photo per Alive Coverage. This past weekend, KAABOO Del Mar Festival returned for its fourth year of bringing Southern California music fans together to celebrate and dance to musicians of all genres. Katy Perry brought the pop, Wiz Khalifa and Post Malone brought the hip hop, and Earth, Wind & Fire and Tower of Power brought the funk. But even with these star-studded artists, it was evident that rock’n’roll stole the show this year to make the point that while your streaming service might disagree with us, rock’n’roll is alive and well. Friday, the first day of the festival, Jimmy Eat World took the stage and set the precedent that although there were a handful of bands performing at the festival that haven’t seen a huge hit in the last decade or so, it does not mean they’re no longer making great music and giving one-of-a-kind live shows. Of course Jimmy Eat World stirred up plenty of energy in the crowd when they played classics like “Sweetness” and “The Middle,” but the group still received plenty of positive reception when they played their 2018 release “Love Never,” a song that seems to captivate everything people love about the band while still providing something new and never-before-heard. Later on in the day, Calabasas, California band Incubus began their late afternoon set with zero apologies. Lead singer Brandon Boyd opened with arguably two of Incubus’ most rambunctious songs: “Anna Molly” and “Megalomaniac.” The energy stayed constant thereafter. For a group that has released only 40-minutes of new music in the past six years, it was surprising that the younger attendees of the festival were jumping and singing as if it was their favorite band growing up. It goes to show that these rock legends have created songs that remain memorable in the collective consciousness of American rock music. Foo Fighters. Photo per Alive Coverage. 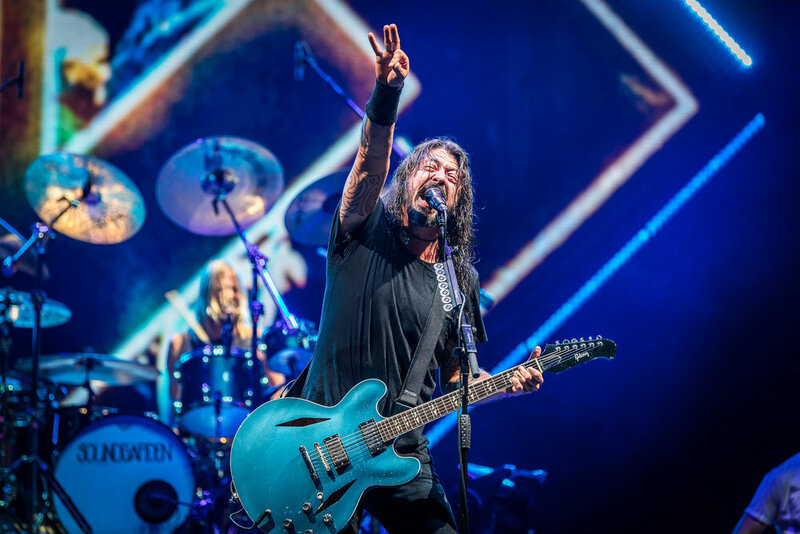 To close out Friday night, Nirvana-alum-turned-Foo Fighters frontman Dave Grohl embodied rock’n’roll throughout the band’s set. It wasn’t just the classics he was playing that proved his incredible reign as a rock lord- originals like “Learn To Fly” and covers like Queen’s “Another One Bites the Dust” were heard- but the sheer confidence and appearance that he was hardly trying, yet epicly succeeding in firing the crowd up really amped things up. At one point, teasing at his legendary status, Grohl yelled to the crowd, “We have 35 minutes left to play 116 songs!” At another point in the band’s set, a train loudly passed by, distracting the band and fans. Seizing the moment, the band played a one minute blues-sounding song just for kicks. It was just another example that proved these performers are professionals, and are still as lively and fun as ever. Saturday was another rock-filled festival day, and this time with more of a focus on rock that is currently popular. Early in the day, Austin groove rock band Mamafesta brought a completely new style to the Del Mar Fairgrounds. With a hint of funk and plenty of jam band qualities in their sound, this melodic four piece group is one to definitely watch out for in the near future if you’re not already! Imagine Dragons. Photo per Alive Coverage. Sunday closed out with, you guessed it, even more rock, this time both new and old. Many fans stayed at the “MGM Resorts Grandview” stage from 3:00PM to festival close to see bands like The All American Rejects, Alice In Chains, and Robert Plant. The All American Rejects did a great job of not taking themselves too seriously. Although the band played fan favorites like “Gives You Hell” and “It Ends Tonight,” they joked between songs that while they may not getting much radio play now, in the early 2000s, it was “hard to escape our music if you walked in a TJ Maxx.” Still, the group gave it their all and played new songs that they were clearly proud to perform. Following All American Rejects was Alice In Chains, a band that had a larger crowd considering the KAABOO attendees were a bit older than other festivals. Alice In Chains did not disappoint, and it is safe to say that their hit song “Rooster” had the loudest-singing crowd of the festival. Robert Plant. Photo per Alive Coverage. As exhibited by a large number of KAABOOers walking around sporting Led Zeppelin and Robert Plant shirts, it was clear that Plant was the most anticipated act of Sunday, even while competing with Katy Perry during the headlining time slot. It was no surprise that Plant payed homage to Led Zeppelin by opening up with the tracks “Good Times, Bad Times” and “Lemon Song.” His 13-song setlist was filled with impressive guitar solos and a little headbanging. Closing with an artist from the iconic Led Zeppelin was the nail in the coffin that rock stole the show this year at KAABOO, and a sign that this genre will hopefully continue thriving at this festival! Dates for 2019’s KAABOO have already been announced for the weekend of September 13th-15th. Get your early bird tickets and festival passes here!